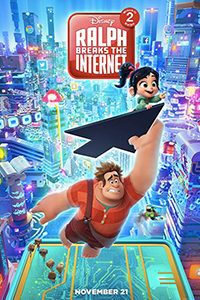 Similar to the digital realm where it takes place, Ralph Breaks the Internet, Walt Disney Animation’s follow-up to their diverting Wreck-It Ralph from 2012, is overstuffed with content, including lessons about how vulnerable and insecure people get swept up into online communities. In turn, those communities often prove to be toxic epicenters of unhealthy friendships based in self-gratification rather than support. Moreover, the movie also warns against the exploitative nature of social media, the possible financial hole of eBay, and how the internet as a whole could be a dangerous place. As world-building goes, the original’s was limited to a few arcade games in Litwak’s Family Fun Center & Arcade, whereas the new, impossibly huge digital landscape feels reductive by comparison to the potential size of the world wide web. And like the internet, in true Disney fashion, Ralph Breaks the Internet finds plenty of opportunities for random ads, and its self-awareness barely softens the gross display of commercialization. 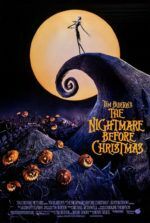 Nevertheless, it has enough oddball moments and insightful lessons to set it apart from other Disney fare. 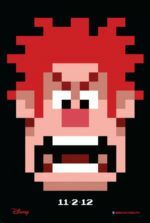 A former villain of the 8-bit game called “Fix-it-Felix,” Ralph (voiced by John C. Reilly) is a large-fisted doofus in shabby overalls who, in the first movie, befriended the glitchy princess Vanellope von Schweetz (Sarah Silverman), the rambunctious racer in a high-speed game called “Sugar Rush.” When the sequel opens, their friendship routine has grown stale, much like the candy-coated tracks of Vanellope’s game. She wants something new, and her desire to change the existing arcade leads to her “Sugar Rush” console breaking in the real world. With just days before Litwak (Ed O’Neill) pulls the plug, Ralph and Vanellope must enter the internet to shop for a new part—yet, they have no knowledge about e-commerce, much less how the internet works. When they enter a physical metropolis where conglomerates like Amazon, Google, and Instagram each have their own skyscraper, and internet users are represented by box-headed avatars, our heroes head to eBay to win an auction for the rare arcade part needed to keep Vanellope’s game running. To actually pay for the item, however, Ralph and Vanellope resort to other means. Before long, Ralph and Vanellope find themselves in the movie’s most inspired and surprising location, a web-based, open-world game called “Slaughter Race,” which seems only mildly less violent than the Grand Theft Auto franchise. Inside the smog-ridden game where sharks leap from the sewers, creepy clowns ride tricycles, and an explosion waits around every corner, Vanellope finds her true calling—to drive and drift in an ever-expanding online world with limitless possibility. She also meets her new role model, Shank (Gal Gadot), the leader of a Fast and Furious-style gang of badasses. Vanellope’s obvious draw to this world sets Ralph on alert so that, throughout the rest of the movie, he worries his best friend may abandon their small corner of Litwak’s arcade for something bigger and better. Being the lovable but clumsy guy that Ralph is, he goes about trying to discourage his friend in the most calamitous way possible. Disney introduces a streak of self-deprecating humor into Ralph Breaks the Internet, offering a mid-story sequence in which Vanellope enters the Disney online headquarters—a location the filmmakers are quick to mine for references to Star Wars and Marvel (including a brief glimpse of the late Stan Lee). Vanellope finds herself in a room with the studio’s various princesses (Ariel, Belle, Cinderella, Jasmine, Merida, Mulan, Pocahontas, Snow White, etc. ), and they remark upon the sexist and narrow patterns of their characterization. To be sure, the studio continues its course correction after defying its own racial boundaries with The Princess and the Frog (2009) and their 2016 breakthrough Zootopia (2016), about searching for acceptance, regardless of race (or species). After decades of perpetuating powerless female roles, racially insensitive characters, and narrow social views, Disney has been taking a step in a different direction. Regardless, the filmmakers knowingly plunge Vanellope into a self-aware “I want” song about her desire to live inside of “Slaughter Race,” and that’s worth the price of admission. Rich Moore (director of Wreck-It Ralph) shares helming duties with his co-writer Phil Johnston from the original. Moore and Johnston also wrote (along with three others credited as “story by”) a sequel jam-packed with plot, conflict, and set-pieces. Similar to the internet rabbit holes that have sucked so many of hours on pointless videos, bogus links, and celebrity gossip, Ralph Breaks the Internet contains random asides and subplots that add to the runtime. At nearly two hours, the sequel feels long and exhausting. 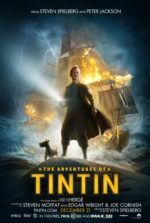 It’s reminiscent of Steven Spielberg’s Ready Player One from earlier this year, where the expansiveness of a virtual reality playground becomes a draining cinematic experience of references, leaving the viewer with a sense of “what just happened.” Even so, after thinking back at the plot, each piece has an essential part in the impressively organized whole. Remove the sequence about Ralph and Vanellope mining from “Slaughter Race” and suddenly Vanellope isn’t introduced to her dream life. Remove the section about making videos for the social media mogul Yesss (Taraji P. Henson) on a platform called BuzzzTube, which pays Ralph for every “like” acquired, and he can’t pay for the part to fix “Sugar Rush” for Vanellope. It’s not that the plot is ineffectual, dull, or uninteresting; there’s just a lot of it, and it carries on and on. Young children in my screening began to squirm, but then so did adults. All the while, I wondered how much of these small children would understand it. The setting is designed to be recognizable to well-versed internet users. Will four- and five-year-old children grasp concepts such as WiFi, search engines, auto-fill, restarts, and the dark web? Maybe they will, which only speaks to the utter digitization of children today. In any case, as the conflicts grow, each is answered by an increasingly elaborate visualization, leading to a web virus that unleashes a million Ralphs, each forming into a gargantuan King Kong-like entity obsessed with holding Vanellope hostage in their friendship. The imagery may be somewhat obvious, but the message about forming emotionally healthy friendships in which all parties are respected as individuals is a complex, albeit welcomed one. 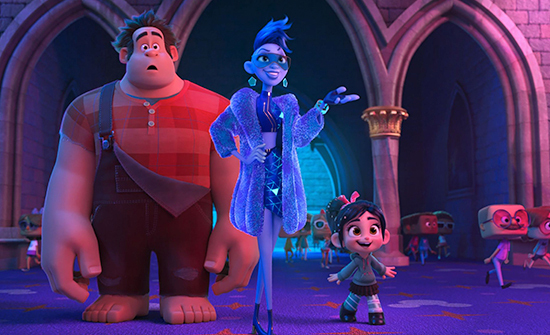 Ralph Breaks the Internet is a bright, lively, CG-animated ride that doesn’t skimp on the product placement or humor for adults. In one moment, the visualization of how social media works is a humorous portrayal, while Ralph’s attempts to earn approval by monetizing himself is a sardonic glimpse into the baseness of such platforms. But the movie doesn’t exactly demonize social media—it warns to “never read the comments,” while showering the audience in cat videos. The treatment reminded me of The LEGO Movie’s popular song “Everything is Awesome,” a tune designed to represent a sad hollowness in the lives of joiners, and yet, sadly, it became beloved by most for its catchiness. Ralph Breaks the Internet shakes off most criticisms with its dazzling racing scenes, neon-colored lights, and ADD-friendly pacing. In the end, it will probably make the internet—or at least Disney.com—look like a fun place for youngsters.